On this episode, Brittany tells us about how she went from grading at home and being a grumpy girlfriend to setting rules for herself that allowed her to focus on self care. She also gives us a little insight on how important she feels it is to build strong relationships with her students and why she feels she needs to make a change for the sake of them. 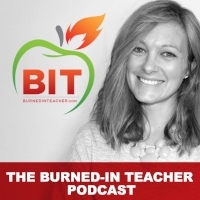 Ep #010 - Always A Burned-In Lesson Series with Gretchen Bridgers Ep 1: What's A PLN and How Can You Get One? Episode #008 - What Type of Burned-Out Are You?